BitBattle is looking for global partners who help us promote activities around the world. We will award you appropriate benefits in return for your efforts and support. 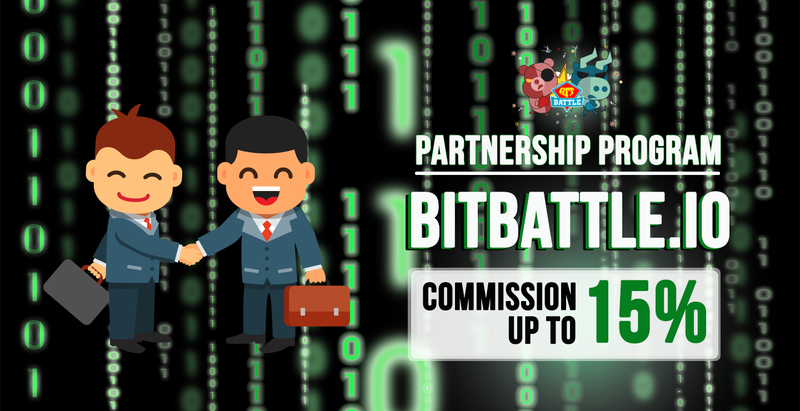 Becoming BitBattle partner, you will instruct and support new users on how to make money on BitBattle and how to proceed transactions on the platform. When newly registered users input your reference code, you increase your income. Regarding how SPIN is born on BitBattle, SPIN (BitBattle internal token) is generated upon depositing ETH/BTC into BitBattle. The conversion rate is 25% which means 25% value of ETH/BTC deposited will create a specific amount of SPINs for the users. BitBattle partner will receive 15% of the ETH/BTC value which is converted to SPIN. Additionally, as BitBattle partner, you even can enjoy upto 5% bonus of the Total Rewards from Battle rooms where your invitees join for battling. The more users you invite to BitBattle and the more rewards in their battle rooms, the more commissions you earn. Instructing your invitees to open BitBattle account and input your reference code. Your reference code is generated automatically by the system. You have the rights to change your reference code only for one time.